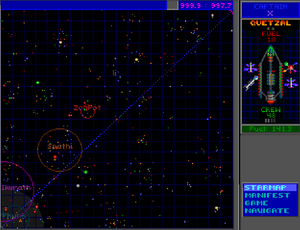 Coreward refers the diagonal direction across the HyperSpace Starmap from coordinates 000.0 : 000.0 (bottom left) towards coordinates 999.9 : 999.9 (top right), approaching the galactic core of the Milky Way galaxy. The Rainbow Worlds point roughly in this direction, with Groombridge as their focal point. This is not to be confused with the Coreward Front. This page was last edited on 19 December 2015, at 20:58.